In the spring of 1988, the landscape of popular music underwent a vast transformation. In the mire of synthesizer-driven pop tunes and power ballads, the sounds of a steady voice with a honeyed timbre, accompanied by an acoustic guitar, gently poked their way to the surface. While Frankie was going to Hollywood and New Order was having a bizarre love triangle, Tracy Chapman was forging a new, socially conscious musical path. In the process, she simultaneously gave folk music a much needed face-lift and a rejuvenated status all while introducing white audiences to the best dreadlocks since Bob Marley. From the moment “Fast Car” and “Talkin’ Bout a Revolution” hit the airwaves, Chapman instantly became one of the most socially relevant songwriters of our time. 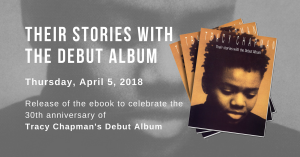 Her debut CD, Tracy Chapman, sold over sold over 3 million copies in the United States and United Kingdom, and quickly became a staple in most music collections. Since then, Chapman has released eight discs. Her latest, Let It Rain, was released earlier this year, and is possibly her starkest work yet. Chapman’s voice is still as undeniably rich and beautiful as her lyrics are eloquent and heartfelt. The melodic sensibility that has been her signature style from the very beginning shines bright throughout the entire disc. While she stopped talkin’ ’bout a revolution years ago, Chapman does not wander far from the folky rhythms that initially catapulted her to stardom and endeared her to fans. Lyrically, she is more revealing than ever; musically, she is more adventurous, incorporating the hushed sounds of a string section on some tracks, and the steady sounds of African drumming on others. And finally, Chapman — with a long-standing reputation for her shyness and reticence onstage — has matured as a performer, becoming more interactive with her audience. Still, Chapman remains somewhat of an enigma. For all she reveals on stage through her songs and their literate lyrics, she seldom reveals anything in person. She rarely grants personal interviews and emphatically shies away from the promotional routines most artist undertake to hawk themselves, a new CD or an upcoming tour. But her guarded privacy and inaccessibility are perhaps exactly what make her music and live shows that much more compelling; they allow a fleeting, but intimate glimpse of and into a raw performer. Next Wednesday, fans should be treated to Chapman’s inner rawness, her socially savvy thoughts and some intimate soul-bearing moments when she performs at the Pikes Peak Center. Opening the show is a duo from Los Angeles called eastmountainsouth. Though the name may be a bit cryptic, their sound is a straightforward blend of bluegrass, country and, oddly, a little bit of L.A. rock. With literary minded lyrics and a heavy focus on acoustic sound, eastmountainsouth is a complementary opener. As is becoming more frequent, the folkies here in C-town are poised for another musical treat. Don’t miss out. Wed., July 2, 8 p.m. The Pikes Peak Center, 190 S. Cascade Ave.
Terry Jones, 07/03/03: Tracy was awesome and very talkative… the crowd was terrible! but tracy tore it up. The subcity was done by request she sang it for some guy named “wade” whom she met outside a few hours prior to the show..she complimented the mountains..and said she had been in colorado since saturday and she felt like she lived her…when she came back and done the encore smoke and ashes she asked the audience if they had a request and I yelled out unsung psalm and she said I cant hear you that well..and put her hand to her ear and leaned forward to try to hear me and my friend….and then someone yelles out smoke and ashes..which I was surprised she had not performed earlier in the show…the biggest upset with me last night was the fact that after she did smoke and ashes (I was 18 rows up) on the floor and people stated leaving thinking it was over the lights were still out..so my friend and I ran up to the front row at the stage and I yelles tracy I told you I would see you again on Weds. and she smiles and waved me..and said I could not hear what song you wanted me to sing…then she sang get up stand up which all the true fans went crazy on….I will anxiously await her to tour again she is awesome…I wish I could remember the name of the song that she said was by someone who inspired her it was something about Kentucky….great song even better since she sang it! p.s while at the front row I yelled to tracy that it was my friends birthday and she told my friend happy birthday..and my friend yelled to tracy that she was the best b day present anyone could get! cool! Tracy is my favorite. thanks!